Biofilms in wounds are a form of infection that is made up of living microbes that are capable of forming colonies. Biofilms are generally composed of varied species of bacteria, fungi, yeasts, algae and other microbes, in addition to cellular debris. A biofilm is formed when certain types of micro-organisms attach themselves to the surface of wounds by secreting a gummy substance. These biofilms are known to infect most of the bodily tissues and may lead to chronic infections and non-healing wounds. 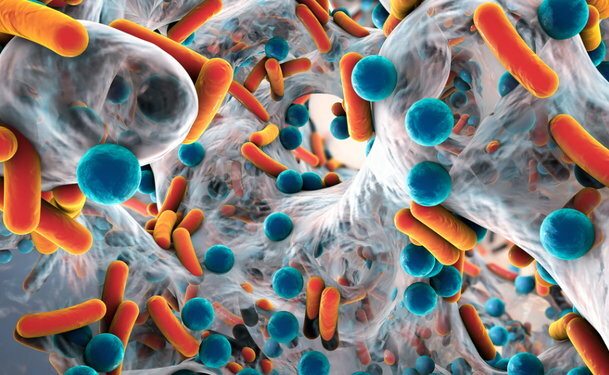 In the United States, around 16 million new biofilm-based infections are diagnosed every year. The microorganisms in the biofilms are attached to one another and to the wounds with the help of strands made up of sugary molecules. These molecules are called extracellular polymeric substances or EPS. The production of EPS helps the biofilm to form a complex, three-dimensional structure within a few hours. These structures can also get detached as clumps of cells which move and may attach to another surface and propagate further. These complex structures are resistant to defense mechanisms of the body. Antibiotics are designed to attack bacteria, and may only partially eradicate the bacteria contained within a biofilm. Hence biofilms constitute a major obstacle to wound healing. Debridement of wounds is done regularly to promote faster healing. Based on the severity of wounds, simple tools such as curette or ultrasound energy are used to eradicate the biofilm matrix. Systemic antibiotics are used to destroy the biofilm microbes and prevent re-seeding of bacteria on the wound surface. Antibiotics that selectively kill the robust biofilm-based bacteria can be advantageous. Their doses should be adjusted after consideration of other antibiotics taken for systemic biofilm-based diseases. Topical agents such as antibiotic creams, silver, cadexomer iodine, and methylene blue eradicate the biofilm and prevent the polluting of the dressings through bacterial seeding. Some dressings, such as gauze, can promote the growth of biofilm and hence should be avoided. In such cases, alginates and polymeric materials are used for wound dressings instead of cotton gauze. Chemicals such as alcohol, peroxide, Dakin’s solution, and acetic acid have a minimal effect on biofilms, can cause extensive damage to the defense mechanisms and should be avoided. Bacteriophages, which are viruses that are known to infect bacteria, are widely studied for the management of biofilm. These viruses are effective in eradicating the biofilm and are found to be safe for use in humans. It is important to avoid placement of skin grafts or replacements on wounds until a biofilm is completely eradicated. Otherwise, there are chances of biofilm using the foreign material as a food source.